Brush your masterpiece with water for a watercolor effect. 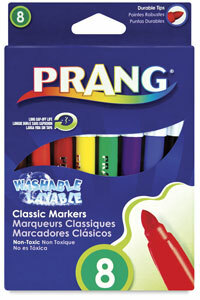 Prang's washable marker ink will wash from skin and most clothing. Red, Orange, Yellow, Green, Brown, Purple, Black, and Blue.